Strange Greek-like Flag Near Portland. Official French Government Flag found in Mexico? 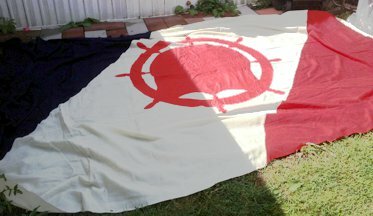 Can you help me identify this flag that was offered to me? Is there a way to determine which edge of flag is the top edge? It could indeed be Russian with unknown emblem, but it looks more RBW with an FA monogram to me. No obvious way - if it's hanging from the edge of a roof. If the top as hung is the hoist (not seen, behind eavestrough), we are viewing the obverse, and it is WRB, and the stitching of the hem seems to support that we are looking at the obverse. This flag belongs to the Broad Front (Frente Amplio, FA) party in Uruguay. The "Russian" flag is clearly the flag of Frente Amplio of Uruguay (with the letters FA). This "Scissors" flags is from "Wonderland" near Toronto. They have these scissors flags mixed among various country flags. The closest I found was the Zulfiqar Flags, a set of former flags from Morocco. No, that's not it; if it were the three flags would have been the same. The configuration of the flags suggests they are for something right in front or behind the pole. So, what attraction was next to it? This flag was found it at a flea market in Pasadena. It is double-sided, and accommodates a flag pole. Anyone know what its from? 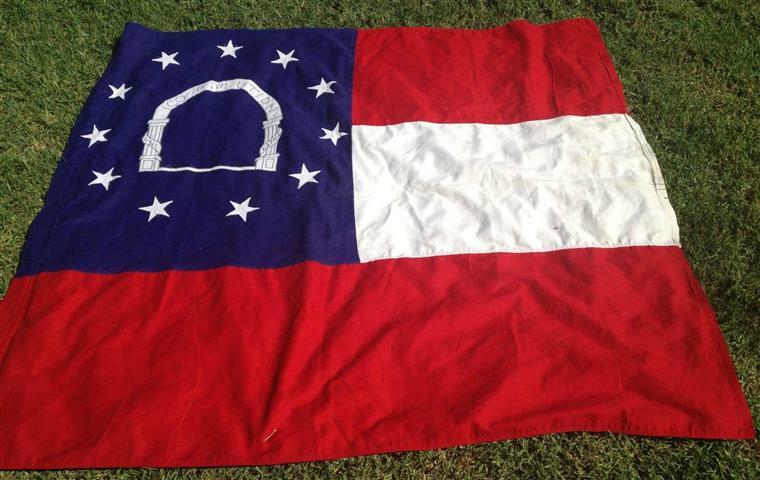 Looks like an unfinished flag of Georgia. This flag was placed on Reddit, but the Vexillologists of Reddit could not identify it. The original poster stated "I got this flag from my dad several years ago and never knew where it came from. It looks like a crest, but it's in flag form. Does anyone know where this came from? And in the same vein can anyone tell me the correct orientation?" Here is some of the speculation made about the flag on Reddit: 1. "The black and white quartered shield is the coat-of-arms of Zollern and the original arms of the House of Hohenzollern, eventually the royal family of Prussia and later of the German Empire." 2. 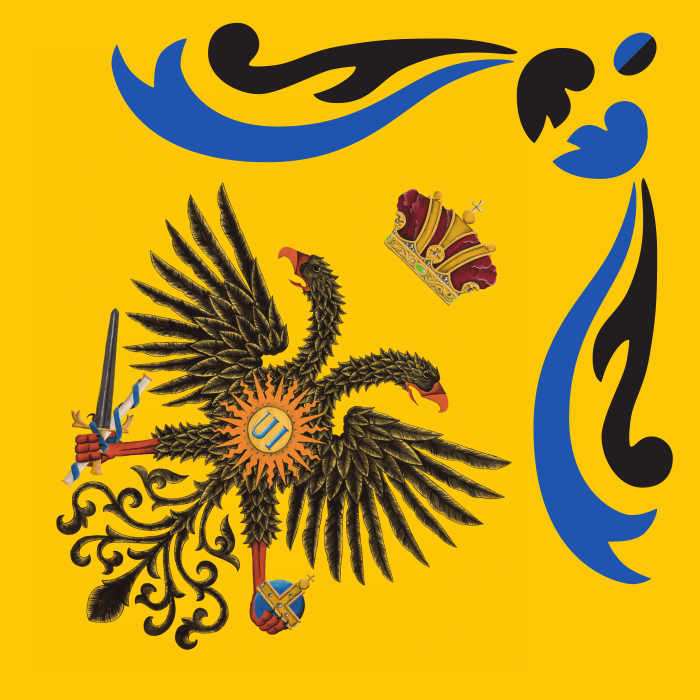 "The two-headed eagle is a symbol of the Byzantine, Holy Roman, and Russian empires, but based on the Zollern arms and the Latin letters (not Greek or Russian). I think it's from the Holy Roman Empire." and 3. "The flag is probably the personal flag of some relatively low ranking German noble." Can any of you comment on or identify this flag? If he doesn't know the orientation, what makes it a flag? It appears to be some sort of wall hanging, podium or decorative banner to me, but we've done coats-of-arms before. I'd say the orientation of the shields and double-headed eagle on the coat-of-arms would indicate the orientation might be diamond-like, or at least provide a strong clue. A size would be helpful. The crown is that of a Russian Tsar, but it might as well belong to Byzantine Empire (I don't know). And the arms above refer to St. Peter (look at the keys in base). It would be interesting to find out whether the flag is a replica or a silken original, and what the size of the flag is? The ratio is similar to a military flag. 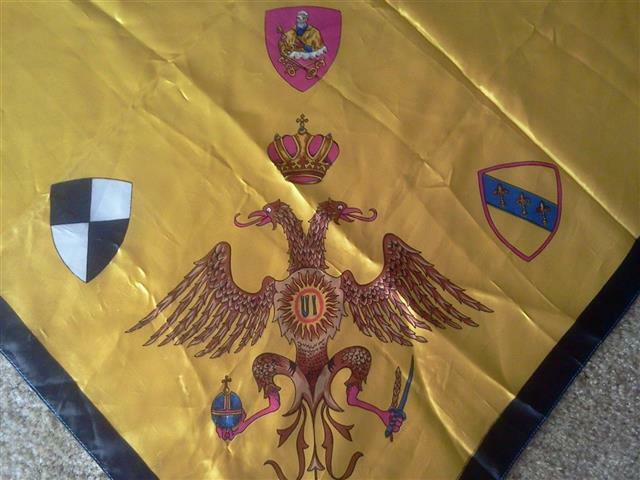 The Zollern family gave princes to many European countries in the 19th and early 20th century, especially to Romania (but they had had a one-headed eagle), and Greece (they even now identify with the Byzantine Empire). 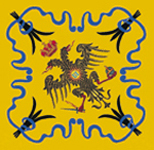 It's a decorative flag of the contrada dell'Aquila in Siena. You can see the coats of arms on this picture. They are the three compagnie militari that form the contrada. Indeed, the palio and contrade are recurrent themes. I wrote on January 21, 2016 a message titled "Italian medieval flags - Quintana di Ascoli Piceno flags (and flag throwing related topics)" where you can see that all of these topics are related and we should piece them together into one section. 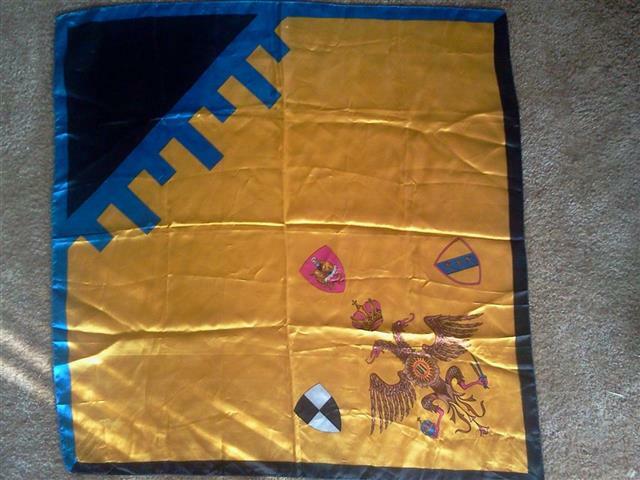 For instance, take UFE 15-22 (Hearst Castle Flags) where a set of Palio flags are seen. Since this is a practice more related to (but not exclusively) to Siena, most people refer to them as Palio di Siena. However, other Italian cities have such flag festivals as well. In fact, Siena and Lucca both feature the Libertas flag featured here on the Siena page and featured here on the Lucca page. Regarding the Alt Wiki, indeed, very nice images by the way (some real, some fictional, but worth taking a look). However, it's interesting to see someone mentioning a misinterpretation from a page, as it gives us the opportunity to delve into the problem and maybe improve our page style: What caused you to merge Klaus-Michael Schneider's contribution and mine above it into one, attributed to him? Is there a way to make the division clearer to you? But, indeed, mine could be considered a tentative identification, as I only said it "looked like [that] to me." Fabio identified it more positively. I think I disagree [about combining pages]. While general things could probably be said about such festivals in Italy [Please do, people! ], il Palio is so rich with flags in my opinion that their specifics should be treated each on its own pages. As it's part of Sienna, those should be Sienna subpages. 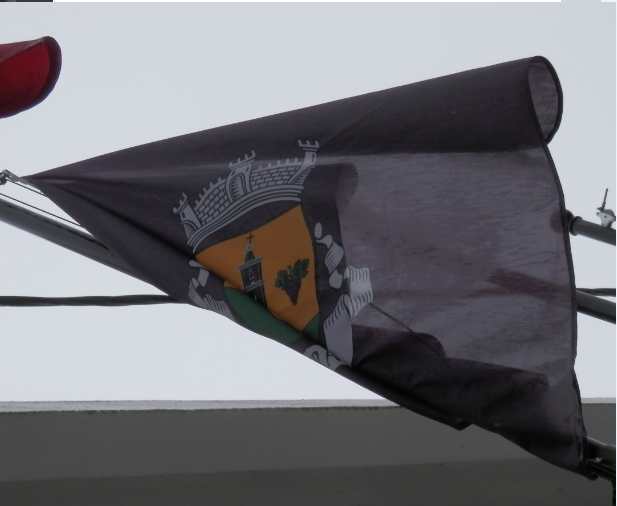 Flag of Onda on house, flag not containing the shields. 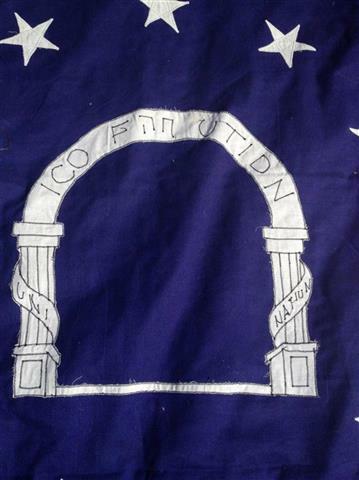 the previous year, contains the shields, but the design is different from the banner, most noticeably the charges are smaller, leaving a larger field in the Onda colours. Did I miss other types of contrade flags? Do other flags appear in the events surrounding the races as well? Any way, apparently the flags change from time to time, which would give us whole series of flags to study. Having said all that, what type of contrade flag do we see if look at the flags at Hearst castle? By the way, is there s skilled graphical artist who would be willing to draw examples of each of these (? ), as they are far beyond what I can do. Do we know that these [Libertas flags] are intended as specimen of the same flag? 1. We should have a more elaborate section to deal with Palio flags (since it is a very widespread practice not only in the Tuscany region, but in other cities of the Italian Peninsula, to continue their medieval heritage). 2. Sienna, as well as Lucca, and other cities, should have their own subsections linking the Palio flags section (as they do indeed have them today). I also agree that these are the sort of flags displayed in such events and they should be included into a section of itself. Also, did you get a chance to see my message(#207235) to the list? I point out details on how the actual games are rated and whoever gets the most flags win (also it includes the types of flags as well). As to your comment on the flags at Hearst castle that is a very difficult thing to answer (but not impossible), since, as you mention, there are several types and I also wish we could have additional help to draw them all. Indeed: I believe these [Libertas flags] are specimens of the same flag. Both Siena and Lucca are in the Tuscany Region and were part of the Republic of Siena (Repubblica di Siena), an independent State that lasted from 1125 until 1555/1559. Its motto is Libertas, and as the entry on the FOTW Siena section states: "Although the Republic of Siena is long gone, after being conquered by Florence during the Medici period, its flag is still flown, along with the City and People ones, from the main Gates, in special days, such as the week of the world famous Palio, as shown under. Thus it is not presented as an historical flag." (no date on contribution, although I assume it was before 2006). Bear in mind that we are currently under the games schedule! (they are held on July 2 and August 16. Also important to highlight, is the fact that in the "Tuscany - Historical Flags" we should include before the entry on the Medici flag the "Republic's Flag" on the Siena section since it predates the Medici conquest of such region. By the way, we seem to be looking at the reverse of the flag. with the eagle holding the orb dexter and the sword sinister. Compared to the Shield of Casato di Sopra - quartered argent and sable - is also in reverse, but strangely that of Aldobrandino del Mancino - blue bend etc. - is not. The details for San Pietro in Castelvecchio are too small to make them out. Does this image work out for you? Also, please take a look at this other flag (source) at the Nobile Contrada dell'Aquila (official website). Yes, it does. That's what the flag looked like 1 July 2011, according to siena contrada dell'aquila, and still does according to Middeleeuws Siena nog springlevend. If my theory is correct, then the design of the tourist flags would probably have had the shields somewhere. The banner, in 2012 looked like this, it seems, assuming that that's the right way to describe it. As for the other flag I think that's a slightly older style. With all of the Internet available the problem isn't as much to find different styles, but more to correctly determine dates and purposes. In my recollection this one used to be quite prominent, though, suggesting that it may have been the last previous style. These websites don't contain as much flag information as I had hoped. 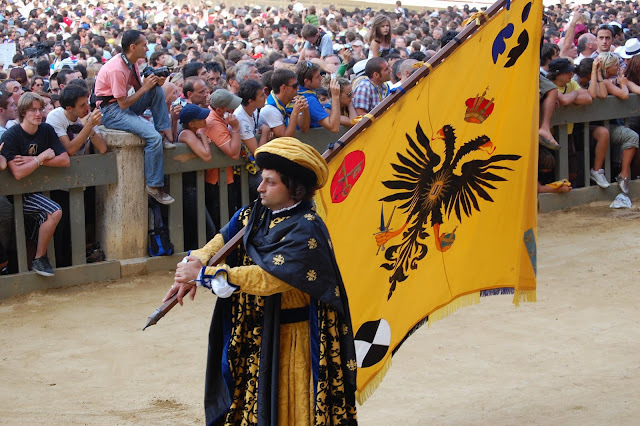 Anyway, I've now found the style we're looking for at "Paggi delle contrade storiche di Siena Aquila Squire Knight Chevalier" (image) and Siena - Il Palio - Contrada dell'aquila. The last one gives 1970 as the year, but seems to show a historical parade, suggesting it's actually a design from earlier times. So should we start looking for designs by year? I know designs change from time to time, so do you think we can cover all of them? Sources: Aquila, palio e contrade and the museum contain several flags as well. This picture was originally posted on Reddit. A Reddit editor posted this information about the picture. "The window and the pole say Oregon Historical Society. Oregon become a state in 1859, a few years before this flag was made. Based on the clothing the picture would be dated from about c1929. Thus the flag might have something to do with the 70th anniversary of Oregon's admission to the Union." Another Reddit user surmised the following: "It has thirty four stars, so it would have to be an American/Union flag. The thirty fourth state to join the union was Kansas, so that might have some significance. The Union flag had thirty four stars from 1861-1863. 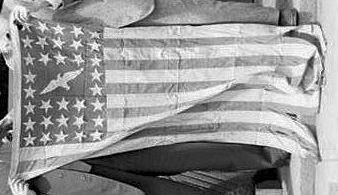 This could have been a regimental flag." 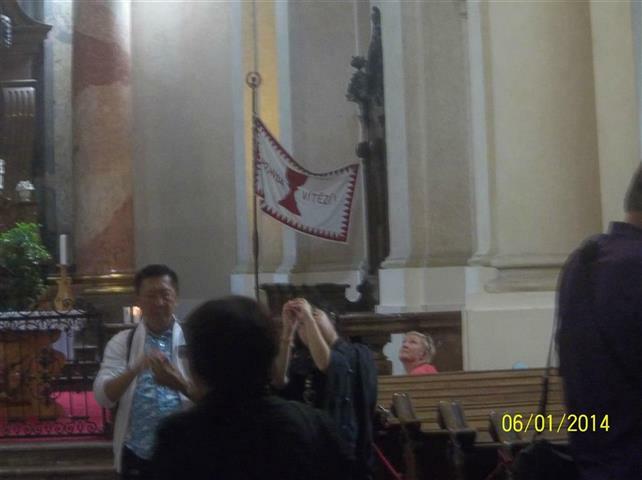 A description originally posted on Reddit: "I was in a Hussite Church in Prague and they had a pair of flags by the Alter. One was the flag of the Hussite Church in the Czech Republic, and the other was this one I have not been able to identify." 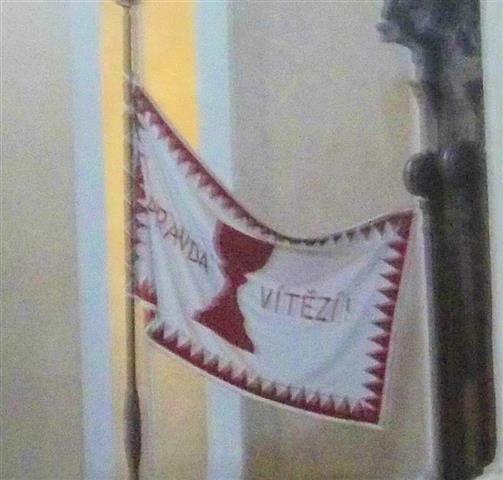 The wording on either side of the red chalice on the flag is PRAVDA VITEZI, which is Slovenian for "THE KNIGHTS OF JUSTICE." There is a humanitarian aid organization called "The Sovereign Order of the Knights of Justice" that works with the United Nations. They provide aid to the poor and the sick, support schools in poor countries, and help children and the elderly people in Europe, Asia, Africa and America. The Sovereign Order of the Knights of Justice is divided into a number of so-called Grand Priories, Priories, Commanderies and Delegations. They are commanded by Grand Priors, Priors, Commanders and Delegates. One such division is the "Commandery of Czech Republic." I'm not sure they have a flag, but perhaps this is it. Seems to be a good guess. As far as I know, the Hussites were divided into moderate Utraquists and radical Taborites (the latter were plundering Saxonia and parts of Brandenburg until they were defeated at Bernau). One of their religious targets, probably of both groups, was to celebrate the communion in both conformations (i.e. bread AND wine). The Catholics celebrated (and celebrate) it exclusively as bread. So a chalice might be an adequate symbol for Hussites. Considering that "pravda" means "truth", isn't it more likely to be the translation of "Veritas vincit", usually translated as "truth prevails"? It looks like the Hussite motto "Truth triumphs over all", is used in that shortened form by Czechia itself. Combined with the symbol of the chalice, that would suggest a Czechian Hussite flag. The use of a chalice on a flag in Prague isn't surprising, the earliest evidence indicates that a "gonfaion" was used for a symbol of the Old Town of Prague as early as 1419, and a Hussite chalice was used on the Prague Banner in c1477. To quote my earlier self: "It was during the Hussite Wars the City of Prague was attacked by the "Crusaders" and mercenary forces, and the city militia fought back bravely under this Prague banner." It is not unexpected to find it also used as a symbol on this modern flag, whatever it may be. This is a typical Hussite flag and is used by the Czechoslovak Hussite Church. So, I am curious about the other flag you saw. Pravda vítezí is indeed Czech for victoria vincit (truth prevails), it was the motto of Hus and his followers, the official motto of the first Czechoslovak Republic, and is still depicted on the standard of the President of the Czech Republic. Does anyone recognize this pennant? It would appear to be a yacht club burgee; It was found with WW2 Japanese and German items. 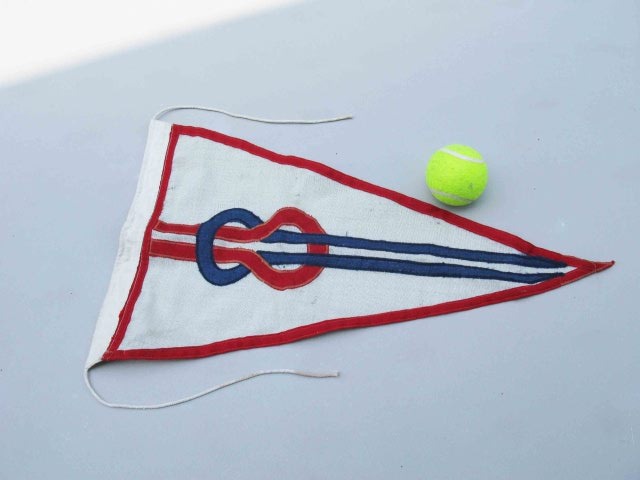 A tennis ball being something like 6.7 cm, this pennant would be approximately 25 cm. high. It might be slightly more because the apparent size of the pennant changes with the camera angle, while the ball's size doesn't. As an aside: Don't connect your ropes that way, unless all four ends are secured. This is an open connection and it will over time move towards loose ends. That's why the well-known flag knot has two of the lines crossed, so there'll be tension to keep it in place. It seems somewhat familiar, but I don't dare to say I've seen it before. I especially don't for all the flag knots I recall. This flag has been positively identified as that of the Vale de Prazeres e Mata da Rainha Commune in Portugal. 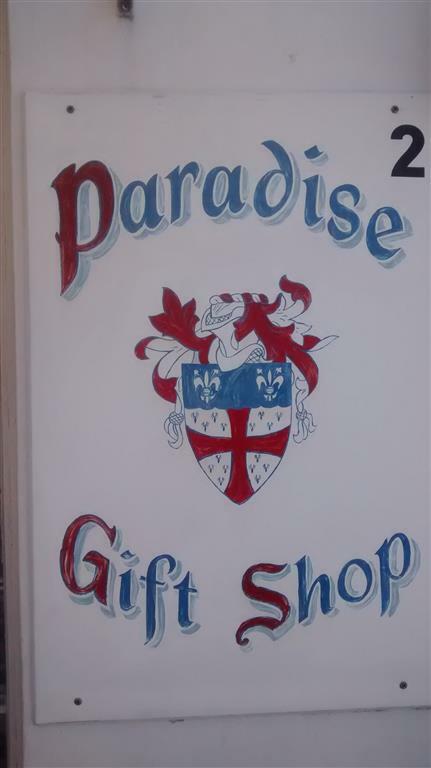 The original poster, Imnimo, said "I saw this flag flying outside a gift shop in St. George's, Bermuda. It's a bit hard to see because it's wrapped around the pole, but it looks like it's the same as the coat of arms painted on the side of the building. After a bunch of Googling, I haven´t been able to find it anywhere - is this just a random family crest in flag form, or is there more too this flag? 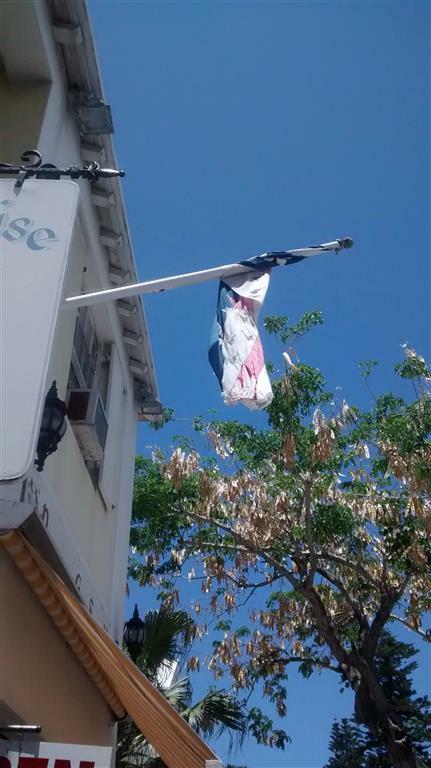 As far as I can tell, it isn't the flag of any Bermuda municipality." 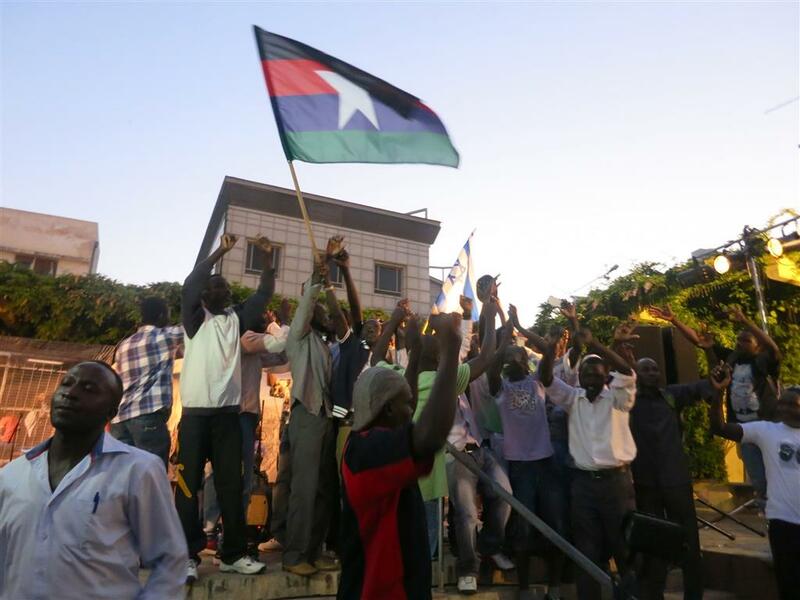 This was the description from wessideride: "Took this photo at a African refugee rally in Israel, could anyone identify the flag for me and give me some information?" Some reddit users posted these theories regarding the origins of the flag. I do not know what the flag represents, however I note that it is the Ogaden National Liberation Front flag (red, blue, green stripes) with an additional black stripe and the star enlarged and re-centred. The ONLF (a separatist group in Eastern Ethiopia) was established in 1984 and diaspora communities are currently commemorating the 30th anniversary of the founding of ONLF on 30 August 1984. The current supporters of Ogaden liberation continue to use the ONLF flag. The photo was taken at a World Refugee Day event on Tel Aviv in June 2013 for World Refugee Day. It appears to have been a rally of 200 Eritreans who were commemorating the martyrs in Eritrea's struggle for independence. Perhaps it is a new Somali Bantu flag? Could this be the new ONLF flag mentioned on our page "Ogaden (Ethiopia)", but not shown? I looked at several Ogaden websites and they are all still using the original Ogaden National Liberation Flag as the de-facto flag for Ogaden (called by some Ogadeniya). Tony Burton of Flags Australia recently helped some Ogaden people in Sydney to obtain hand-wavers of this flag for their 30th anniversary commemoration. Chrystian Kretowiicz on 5 Dec 2010 included this illustration of the ONLF flag. It has the ONLF emblem on a white over red bi-coloured flag. As you can see - it is not our UFE. In 2009, the OLF was divided in two factions: the OLF-QC (Oromo Liberation Front - Qaama Ceehumsa) and the OLF-SG (Oromo Liberation Front - Shanee Gumii), both using the same flag. In 2010, one of the factions created the Revolutionary Democratic Oromo Liberation Front (RDOLF). The white over red could be the unknown flag of RDOLF that in 7 March 2011, joined the ULFO. It is known that the OLF didn't change its flags and the main faction is now using the R-V-R flag. The flag of ULFO is the N-R-W version. 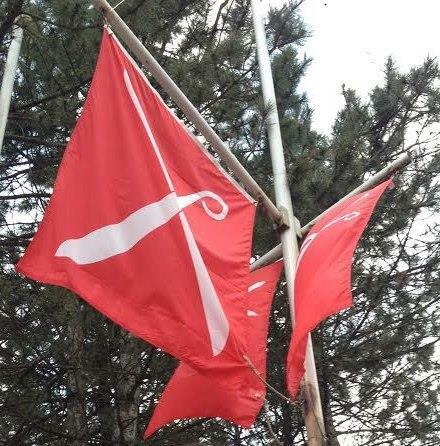 The RDOLF flag is not known to me. 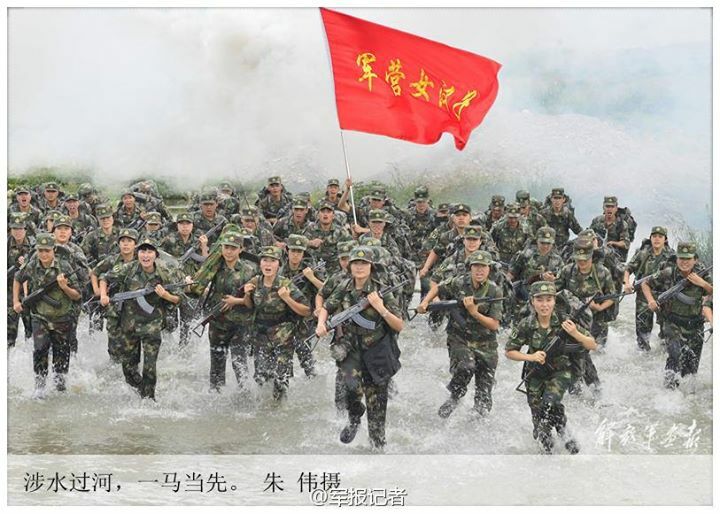 The image from Christyan could be, in fact, a partial image lacking the black upper stripe, rather than a accurate image of the RDOLF flag. Many of the Oromo groups use the N-R-W colors with their own emblem, or variants of this arrangement. An extensive article about flags of Africa, Gambella, Harar, Oromia and Ogadenia will be published in Flag Report 72 that will be distributed in October 2014. 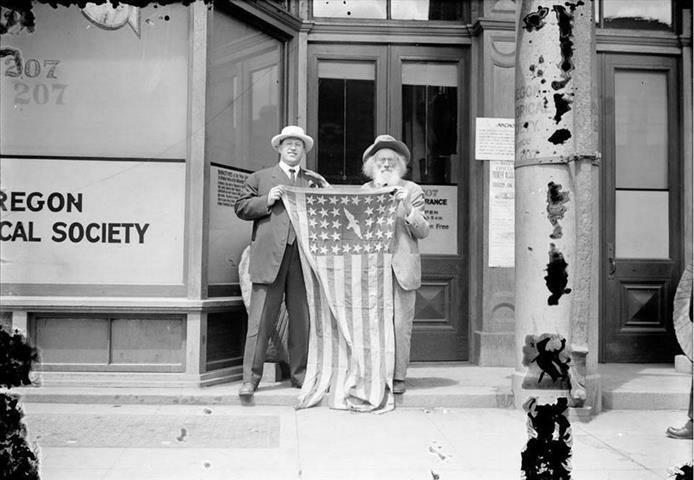 This photograph was also used on this article on the Jewish Journal website, which also included a different photograph showing the same flag. There was no mention of "wessideride" as a source in the article. 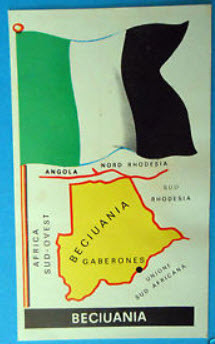 On the Italian Ebay one can buy a collector´s card with a strange design for a flag of Botswana (Beciuania), namely a green-white-black vertical triband. Is this purely fictitious or an early design? Any idea who this particular flag with what appears to be the French tricolor in the upper hoist might belong to? I have never seen it before, but if the photo was taken in Mexico, it might date back to the occupation of this country by the French army (along with British, Spanish and even Belgian troops, but only the French stayed there for a while) in the XIXth Century. I don't think the French army had enough time to establish a local administration. Way outside my area, but could this flag have anything to do with the period in which the Emperor Maximilian ruled the country with French support? Is three years long enough to establish an administration which would require a flag. 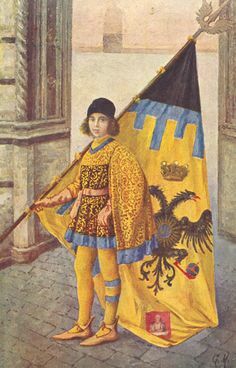 The flag does not have the coat-of-arms used during the Second Mexican Empire of Maximilian I, but the shield on this flag has a double-headed eagle and may have a connection with Maximilian's Austrian or Holy Roman ancestors, perhaps Austrian troops sent in support of the French claim? Notice the similarities to the Austro-Hungarian coat-of-arms. Examples at Austro-Hungarian Empire: Imperial Standards and Austro-Hungarian Empire: Military Flags. An article in the online version of the New York Times on September 11, included a picture of a flag of an anti-ISIS group seen during the siege of Amirli. The picture (seen here in its entirety) has a caption that reads "Shiite militias last week after helping free the town of Amerli in northern Iraq from an ISIS siege". The main article deals with the "strange" and rather "odd" alliances that this group (ISIS) has brought together against it. 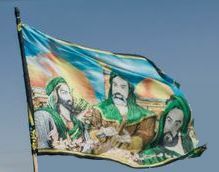 The flag shows three men, most likely important figures in Islamic religion, maybe prophets or Imam´s, since they seem to be holding books, scriptures and all sorts of sacred items. Since there were so many belligerents in this particular battle making up the informal coalition of ground forces battling against ISIS, plus Ameril (Amirli) being predominantly populated by Turkmen, it indicates that this flag is of Turkmen origin. Members of the coalition included the Iraqi Turkmen Front and various Special Groups (a term used by the US to identify Iran-backed Shia paramilitaries in Iraq), including the Promised Day Brigades, the Asa'ib Ahl al-Haq, the Kata'ib Hezbollah, the Badr Brigades, and the Peshmerga, who are the armed forces of the Kurdistan Regional Government semi-autonomous Region. 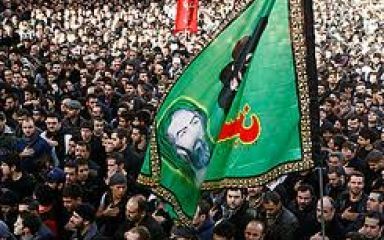 I found information on this group Arab Revolutionary Brigades on the Tracking Terrorism website and in this entry, they show this flag which displays another religious figure, very similar to one of the faces displayed on UFE 14-64. Maybe it is a common thing to display faces of important religious figures in rebel groups' flags (against current Assad regime and against Isis as well), although I'm not certain of what they mean nor who it is. If I'm not mistaken, portraiture is only used by Shia, not by Sunni. This has been identified as a World War II era US Army Transportation Corps Flag. Two days ago, on September 21, the Spanish newspaper El País published an article on recent pro-Ukraine protests in Moscow. In this article one can see this orange UFE. The very next day, on September 22, Qatar-based news outlet Al-jazeera published another article on the same topic, featuring the same image with the same orange UFE. 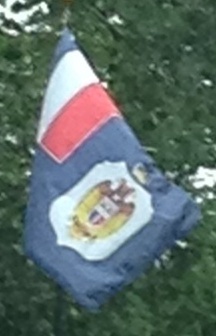 Does anybody know what this flag stands for? 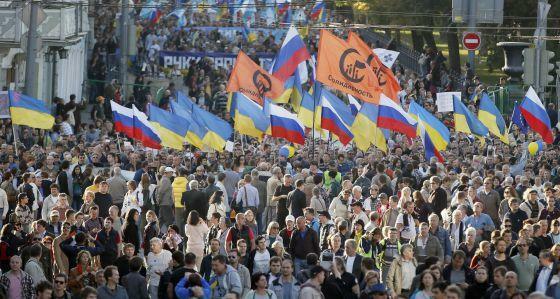 This is not an Ukrainian flag, but rather the flag of the United Democratic Movement "Solidarnost" (Solidarity). Founded in 2008, one of co-chairmans is world chess champion Garry Kasparov. They use orange flags with black or white logo, white flags with orange logo etc. Yes. You can find more information about this movement on Wikipedia. Is this a separate organisation from the Ukrainian "Solidarity" (old name for the Petro Poroshenko bloc)? 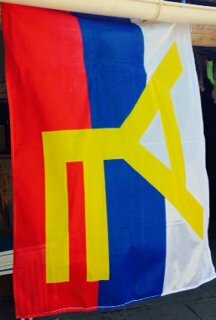 Can you help me identify this flag? It is a red horizontal flag with yellow inscription in (what seems to be) Mandarin. It reads "She-heroes of the barracks". I found this photos of an event held in Russian cultural center in Belgrade two days ago. The gray haired person standing besides the bishop is HRH Prince Alexander Karageorgevich. The flag (#68a), however, hanging on the wall behind them is unknown to me. It resembles the flag of the patriarch of Serbian Orthodox Church. It has full coat of arms of SOC but placed on dark red field instead of Serbian tricolore with a white border with interlaced series of blue and red triangles. 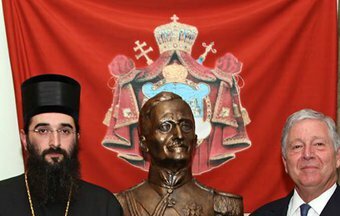 The flag is placed on the most prominent place during that event although the patriarch was not even present (hence the presence of the Bishop-vicarious Arsenios). Do you have any information about this flag?" Also, on today's practice for military parade in honour of Liberation day of Belgrade, at which President of Russian Federation Putin will be present, the river flotilla was using another flag (#68b). 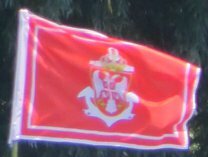 By it's position it should be a military navy jack - Vojnopomorska pramcana zastava. However, I couldn't find any confirmation and hope you'll be able to identify it. From what I am aware, #68a is not any flag with any official status, simply an ornamentation on textile. It it hard to tell from the photo, but the item may not have even been intended to be displayed as a flag. 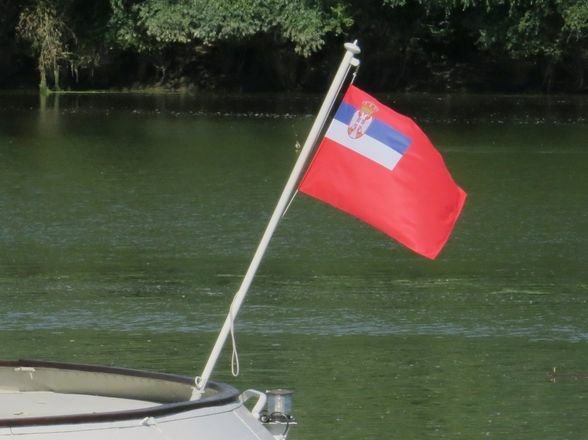 I have noticed that Serbian military ships tend to use in recent years various flags from the International Sygnal Code during the excercises and events - which I assume they are tactical signals specific for the excercise. Then again - I haven't found any legislation/regulation on the naval ensign as used at least since 2007 (probably with minor corrections to the COA style introduced in 2010). I am afraid that I was not being much of help. I saw this flag during an independentist demonstration in Barcelona last Sunday. It looked like an Ucranian flag, but with a obviously Catalan shield in the middle. I think it also had a crown over it. Might it be a municipal flag? Seems more Aragonese then Catalan proper. Probably it is no municipal flag. I checked all municipalities with known arms of Catalonia, Aragon, the Balearic Islands, Murcia and the Valencia Community plus Alghera on Sardinia (they have a Catalan speaking slight majority), but unfortunately no match. And no perfect match about the rhombic shield, which at least should be somehow Catalan. The best match, but not a good one, is the Crown of Aragon. In the arms and in those of current Aragon region there is one quarter in dexter base displaying a St.George cross with four moor's heads, one in each of its quarters. The cross in our UFE might also be taken from the arms of the Duchy of Catalonia, and the moor's head might refer to Sardinia (not very likely to Corsica). 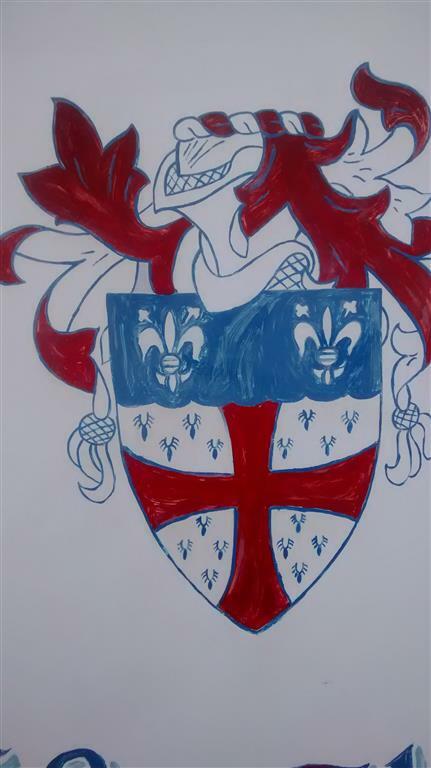 It is a shock, how little information about the meaning of the Aragonese arms is provided in the www. I only found this: The blue quarter with white cross patty fitchy displays the cross of Íñigo Arista, Count of Bigorra and 1st King of Pamplona, his kin ruled Navarra from 816 until 905 (more detail in Spanish see here). The cross with moor's heads in the Aragonese arms is referred to as "Cross of Alcoraz". Alcoraz is known from a battle fought in 1096, where King Pedro I of Aragon defeated Emir Al-Mustain II of Zaragoza. I still found nothing about the tree topped by a red Latin cross. The tree topped with the cross is the Coat-of-Arms of Sobrarbe.